Francine's Friends: Help Francine’s Friends Win $15,000! Just VOTE! Please SHARE this with ALL your friends! VOTE for "Byron Health Center and Breast Diagnostic Center” to benefit Francine's Friends in the PINK GLOVE DANCE Contest! Byron Health Center and Breast Diagnostic Center would be very grateful if you could take a minute and help get Fort Wayne, IN to #1! Click here and Vote Online and Help Francine’s Friends Win Up to $15,000! 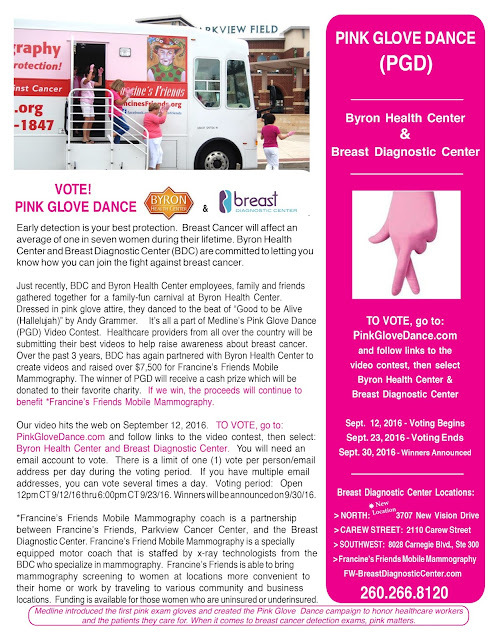 Vote for the "Byron Health Center and Breast Diagnostic Center” link at Pink Glove Dance! Voting is from September 12th to the 23rd, so VOTE ONCE A DAY from ALL of your email accounts!